Is rock dead? 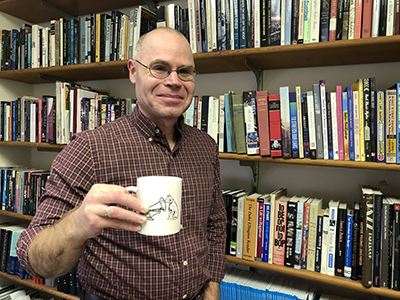 “Not if you’re really listening,” says Theo Cateforis, associate professor of music history and cultures in the College of Arts and Sciences (A&S). 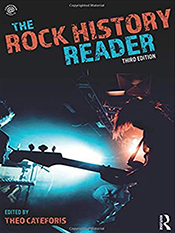 The author of the perennial seller “The Rock History Reader” (Third Edition: Routledge, 2019), Cateforis may be one of the genre’s greatest evangelists. He also is the new president of the U.S. chapter of the International Association for the Study of Popular Music (IASPM). “Rock has historical and cultural value that’s worthy of study. For students curious enough to dig, they will find all sorts of great, new music out there,” says the former drummer, who recently hosted a visit by Anthony DeCurtis, longtime contributing editor for Rolling Stone. A&S caught up with Cateforis, who teaches in the Department of Art and Music Histories, for a backstage look at the excitement. 1. Why do you think your book [now in its third edition] is so popular? Rock has a long history that interests people, especially undergraduates. I am proud to see many colleges and universities using my book as part of their courses on rock music and American popular music. My goal with this edition was to keep the contents in step with the times. Most of the new readings deal with recent changes in the industry, such as the rise of Spotify, royalty issues, the impact of social media, the dearth of rock stars and the crisis facing electric guitar manufacturers in an age where rock is no longer king. I am researching the history of alternative rock, most immediately for a chapter in a forthcoming edited collection. Ultimately, I want to do a book-length study [on alt-rock], examining its musical and cultural impact during the 1990s. 3. How has the field changed from when you started out? As a graduate student in the early ’90s, I could count on one hand the number of music historians who had written dissertations or full-length studies on rock or popular music. Now, it’s a commonplace and widely accepted subject within the discipline. Popular music studies is one of the fastest growing areas of scholarly pursuit among academic music societies. 4. How does IASPM fit into all this? The first conference I ever attended as a graduate student was for IASPM. It was an eye-opening experience to meet so many scholars of popular music. That is one of our most important functions—providing a venue for those studying popular music to connect and network with one another. It also was through our in-house publication, The Journal of Popular Music Studies, that I published my first article [about the post-punk group Sonic Youth]. I cannot stress enough how important IASPM has been to my career. 5. If you could meet any musician, who would it be? The legendary bluesman Robert Johnson, who died under mysterious circumstances in 1938. I would ask him if he really sold his soul to the devil in exchange for his prodigious [guitar playing]. He might find it interesting or amusing to know that such a myth has circulated about him.